I'm trying to figure out a weird issue in my Content Search. It just doesn't sort alphabetically by SiteTitle. 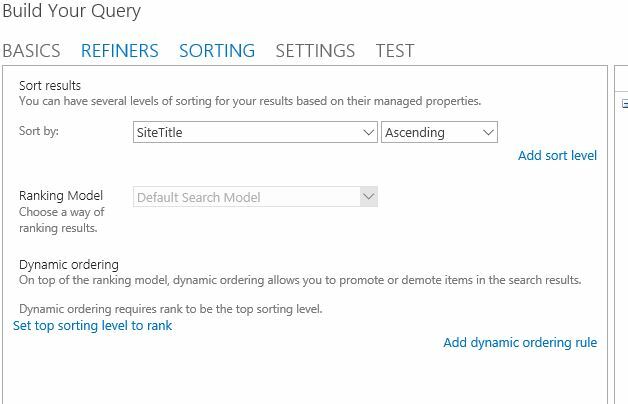 I've gone into Build Your Query, and selected the Sorting tab. (Earlier, I went into Central Admin and made sure the property SiteTitle had Sortable Checked, and then I ran a full-crawl) Here's my screen shot of showing my sort, but the results are not alphabetical by SiteTitle. The seem to be sorted by the sites that are used the most. Appreciate any suggestions on how to get this to sort properly. Check if the OWS_SiteName managed property has checked Sortable.